Cheesecake is one of the most universally loved desserts in my eyes! Whether you like yours with a citrus hit, baked instead of chilled, there is a recipe for every single flavour combination you can think of. I'm a chilled cheesecake type of girl; mix that with a hit of sweet and a hit of salty, I'm in total heavennnnnn! With that, let's say hi to my Chocolate Pretzel Cheesecake. 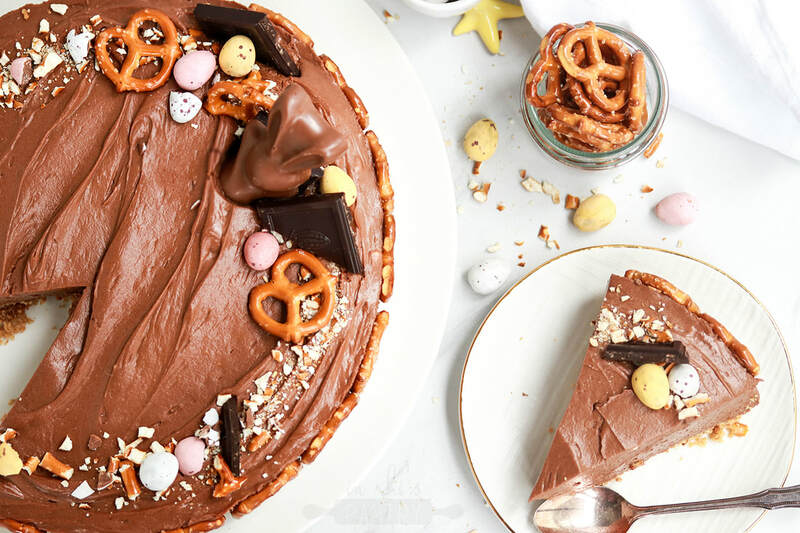 A subtle ode to Easter (which can be easily omitted), this cheesecake is well balanced and puts a little sophisticated twist on classic Easter desserts. At the base is a biscuitty, pretzel crumb bound with browned butter, which gives the most delicioussss pop of flavour to the crust. Topped with a rich chocolate cheesecake filling, you can then garnish this as much or as little as you desire, it's so simple. Enjoy! In a food processor, blitz the biscuits and pretzels to a crumb. In a pot, melt the butter over a medium heat and simmer until it reaches a light brown colour. Pour into the biscuit mix, and blend to bring together. Press the crumb into a greased and lined removable based cake tin, and place in the fridge to firm. In a large bowl, use a whisk or hand mixer to cream together the cream cheese and sugar until smooth. In a separate bowl, whip the cream to a soft peak and set to the side. Into the cream cheese mixture, fold through the melted chocolate and vanilla, followed by the whipped cream (stir just enough to incorporate). Spoon the cream cheese mixture over the chilled base, and spread with the back of a spoon. Refrigerate for 4 hours or overnight. Remove the cheesecake from the tin, garnish with your desired toppings and serve!